Yesterday, I laid out why the new Netflix original content plan could be a game-changer in terms of television content and the ultimate disruption of cable. But it still all depends on if the show(s) they pick end up being hits. It appears that Netflix’s first bet, House of Cards, is just about as good of a bet as you could make — but it’s still no guarantee. Here’s an idea that could be much more of a guarantee: saving cult hits. Each year, dozens of shows on network and cable television get cancelled. Most of these cancellations are for good reason. But every once in a while the hammer comes down on a show that’s considered to be a cult hit — or one that could turn out to be a real hit, if given more time. The problem, of course, is that these shows often don’t have the massive viewership numbers to sell a large amount of advertising against. But that model doesn’t apply to Netflix. While shows that are called “cult hits” are often thought of as mainstream flops, the reality is that they still have millions of people who watch them. And the “cult” aspect implies that a large percentage of those viewers are insanely loyal to the show. Again, that doesn’t mean much to the networks where more is better (for advertising), but for Netflix, if they could convert a significant percentage of those loyalists in to paying customers, it works. The perfect example of how this could work is probably the old Joss Whedon cult hit, Firefly. Firefly lasted only 11 episodes — not even one full season — in 2002 on Fox. The network cancelled it before all 14 produced episodes were even shown. Why? Low ratings. But in the years following the cancellation, the show has seen new life on SciFi, DVD, and especially the Internet (including Hulu and yes, Netflix). The cult status got so big, so quickly that Universal decided to make a feature film, Serenity, in an attempt to cash in where Fox could not. Of course, that didn’t work out as well as hoped either. But again, it was the wrong idea. A Netflix distribution model would be the right idea. There has been talk for years now of a show revival given the cult status and the fact that Whedon had originally intended the series to run for seven years. But that would still mean dealing with one of the networks once again. Until now. A production company would still need to back and ultimately pay for new episodes, but Netflix could now step in and produce millions of dollars for the first window distribution rights. It would be pretty attractive to all sides — though it may also involve buying rights back from Fox. Would the economics ultimately work out? It’s hard to say for sure. Even the House of Cards bet is still very much a bet for Netflix as well. But I do think that a proven cult hit like Firefly would be much less of a gamble (and could likely be secured for cheaper than House of Cards was). And that’s just one example. Arrested Development. Battlestar Galactica. Twin Peaks. These are all things that could succeed where they failed on television because it’s an entirely different model. You’ll note that many cult hits are often science fiction shows, which are also often the most DVR’d shows on television. This also plays into the low ratings and advertising woes. But again, DVR does not matter in the Netflix universe. 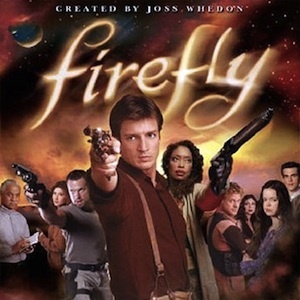 Firefly averaged about 4.5 million viewers when it was on the air in 2002. Let’s say that Netflix could convert just 500,000 of those to paying customers (who weren’t previously) in order to continue watching the show. That would be a half million people paying at least $8 a month. That’s $4 million a month in revenue. And $48 million a year. And you can assume most would end up as multi-year subscribers. I smell a comeback. Or several.